If you saw this two days ago (or just got the email with the draft version), I'm so sorry, but this post ended up going live before I actually finished it. So, this is the completed version. If you didn't see that first draft, then just pretend you didn't read this at all and continue to the next paragraph. So here we are at another Wellness Wednesday. Now I know I haven't talked in-depth about my weight in the past. You know that I want to lose weight and get healthier, but it's a deeper issue than that. You see, I gained a drastic amount of weight from my junior year of high school into college. A lot of this was due to stress and my habit of emotional eating. I've since made changes in my life, and I'm doing a lot better now than when I was 18. However, one of the side results of gaining so much weight in such a short amount of time was stretch marks. I've gotten to a point now in my life where I am comfortable in my skin. However, I've always wanted to try and do something about my stretch marks that didn't require drastic measures. 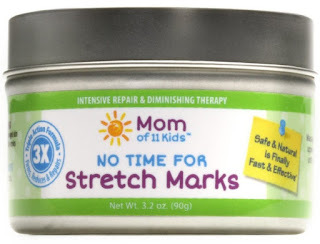 So when I was given the chance to review Mom Of 11 Kids' No Time For Stretch Marks lotion, I was all for it, especially once I learned more about it. No Time for Stretch Marks is formulated with seven all-natural butters and oils to nourish damaged skin and help regenerate skin cells. Our patented technology quickly repairs and diminishes the appearance of even the most stubborn stretch marks. - For use on belly, arms, thighs, sides, breasts - you name it! I loved using this! After using this for a month, I noticed my stretch marks diminishing. And not only did it help my stretch marks decrease, but it also smells good and makes my skin feel great. I haven't noticed an enormous difference yet, but I will definitely keep using this, as this is one of the only products I've ever tried that actually made a big difference in decreasing my stretch marks. I know the price seems a bit much, but truthfully, you don't need to use a huge amount to make this work, so it's worth it. If you're trying to diminish your stretch marks, I highly recommend giving this a try.